What’s a student strike? Can the education minister cancel the semester? How many students are in the streets? This week, new Quebec education minister Francois Blais made big news when he came out on day two of a student strike and threatened to cancel the semester of striking students. The minister broke with the government policy of referring to student strikes as “boycotts” by calling on students who opposed the strike to show up to their general assemblies and vote against. Nevertheless, he insisted there was no right to strike accorded to students. Can the minister follow through on his threat to make students pay if the strike continues? We’ll get to the bottom of it, along with all your burning questions about the current Quebec student strike, in this handy explainer. UPDATE MAR. 28: On Mar. 25 in Quebec City, a police officer fired a modified pyrotechnic tear gas canister into the face of Naomie Tremblay-Trudeau, an 18-year-old student, at point blank range as she tried to run. Rushed to hospital in an ambulance, doctors told her her injuries could have been life threatening if the impact had landed differently. “As soon as I saw the projectile, I wondered if I would still be able to breathe. I was just hoping to not die there. I needed help to move. It was fear, so much fear,” Tremblay-Trudeau, who has vowed to return to protests this spring, told the Journal de Quebec. Despite serious facial injuries and difficulties speaking Tremblay-Trudeau has done extensive media interviews in Quebec denouncing police abuses, asserting her absolute right to protest peacefully in the street and categorically rejecting the suggestion that she allow fear to prevent her from returning to the front lines of ongoing anti-austerity protests. Instead, she has announced her intention to sue the officer who fired on her, and likely the police force and city as well. What the hell is going on in Quebec anyway? Though it may have appeared spontaneous, the student strike of 2012 took a year and a half of preparation. Since last fall, Quebec students, along with other elements of civil society such as unions and NGOs, have been mobilizing against Liberal premier Philippe Couillard’s austerity policies, typified by deep cuts to public services. That mobilization led to this week’s strike. If you want to see what the streets of Montreal have looked like during this strike, check out our video report. Unlike any other jurisdiction in Canada, Quebec has legislation that affords accredited student associations powers and rights very similar to those of labour unions. Among other provisions, the Act Respecting the Accreditation and Financing of Student Associations states that an accredited student association has a monopoly on representing students at a particular campus, and that the democratic instances of the association (such as general assemblies) constitute its highest decision-making authority. Quebec has a long-standing tradition of student strikes, which happen at least once a decade and are largely credited as the reason Quebecers pay the lowest tuition in North America. Former Liberal premier Jean Charest campaigned for free tuition and participated in strikes. Many lawyers argue that an established right has been acquired for students to strike, based on decades of precedent of successive governments and educational institutions recognizing such actions as legitimate and democratic. As it stands, educational institutions are legally required to recognize their accredited student association and respect its collective representation of their students. When it comes to recognizing strike votes at general assemblies, it’s a grey area. Institutions are supposed to respect the decisions that students take, but are not explicitly obliged to respect strike votes. Students, on the other hand, consider decisions taken in a general assembly ironclad and binding, and will often form picket lines to ensure all students respect the collective decision. As you might imagine, these can get confrontational. In many cases this week, schools such as Concordia chose to respect the wishes of their students and cancel classes rather than face picket lines. Is this strike like the one in 2012? Not at the moment. In 2012 at the height of the strike, up to 200,000 students were striking out of a provincial student body of over 400,000. The majority of striking schools were on what’s known as a renewable general strike, meaning no end date was set and students held a general assembly each week to vote on whether to continue the strike. In the case of this week’s strike, 50,000 students from over 40 student associations are on a renewable general strike mandate. Most will vote on whether to continue their strike at general assemblies scheduled for Apr. 7. The largest demonstration yet is set for Apr. 2, and over 95,000 students have already voted to strike that day, with another roughly 100,000 set to be consulted next week. Other associations voted for a limited strike mandate, with many choosing Mar. 23 and Apr. 2. Others added Mar. 24. The striking schools are mostly affiliated with the Association pour une Solidarité Syndicale Étudiante, whose umbrella coalition led the 2012 strike, although independent schools and some affiliated to the more centrist student federations have also joined the strike. ASSÉ represents over 80,000 students, and is the incubator for a radical version of direct student democracy that sees students as guardians of broad social progress. ASSÉ executives take little to no salary, commonly work 80-hour weeks and take their work more seriously than some heads of state. For them it’s a social obligation to hold the line for the next generation. If most students voting next week choose to strike on Apr. 2, we could see close to 200,000 on strike that day. For now this is a limited strike, but if it picks up momentum, and especially if the students striking on Apr. 2 choose to join other associations in a renewable general strike, it could get huge in a hurry. UPDATED Mar. 29: I forgot to include that the stated goal of the student strikers is to trigger a broad general strike as the contracts of half a million public sector workers come up for bargaining. If an existing student strike were to be joined by a significant number of public workers rebuffed at the bargaining table that would be an almost impossible force for a government to ignore. However in the recent history of the Quebec student movement the unions have often talked a big game about calling a social strike, but have not followed through. The minister of education said the government was prepared to cancel the semester of striking students. Can he do that? As in 2012, in the case of a protracted student strike, the pressure is on the government to settle. The reason can be found in the capacity of educational institutions to absorb unexpected new students. If a semester were ever cancelled, an entire class of students would be held back from graduating at the same time as a new class of students took their place. The system cannot accommodate such a double cohort, not to mention that delayed graduations would have consequences for the economy. A double cohort would be far more costly to the government than a makeup semester in early fall, as happened in 2012. We need only look at the tremendous expense and consequences of Ontario’s elimination of grade 13, which created such a double cohort a decade ago. Arguing that austerity will force the far more expensive and economically damaging option is a bluff by a minister new to the file. In 2012 the Charest government took the most drastic step it could to kill an ongoing student strike, cancelling the winter semester and scheduling a condensed makeup period prior to the resumption of classes in fall. There was no love lost between the premier and the students, who eventually ended Charest’s political career. If he could have cancelled their semester, he probably would have, but the double cohort issue made it impossible. That isn’t to say that there is no scenario where the minister’s threat could be acted upon. If a few schools stay on indefinite strike for months by themselves, the government could cancel their semester and accommodate the double cohort. But those associations won’t continue to strike alone, because that isn’t how the Quebec student movement works. Quebec students meet in general assemblies at their school many times a year to vote on the business of their student association. Elected executives are caretakers, bound to enact the decisions of the general assembly and often subject to immediate dismissal by that body. Quebec students see themselves as part of a broader movement, and apply the same principles of collective action that dictate the actions of their associations at the provincial level. The associations that have gone on unlimited strike already are attempting to lead the student movement and pull other associations after them until a critical mass is reached and the movement acts in unison. If other schools don’t join them, they will almost certainly end their strikes. What’s going on with the cops? I’ve seen some wild videos. No kidding. Here’s what we know. 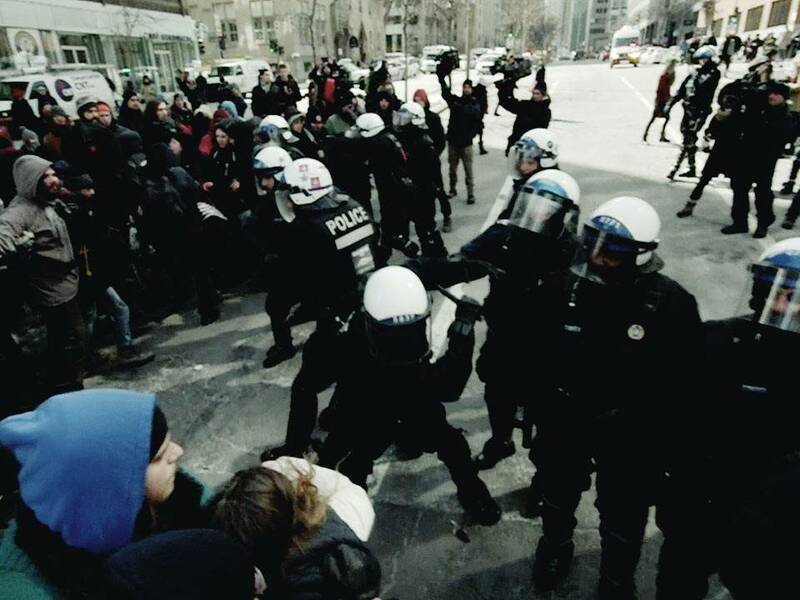 Police in Montreal and Quebec City are declaring protests illegal before they begin, and proceeding to surround, arrest and ticket participants. They derive the power to do this from controversial bylaws that require protesters to provide a route to police. A Montreal judge ruled earlier this year that holding them accountable for whether organizers submitted a route was an unjustified restriction on the rights of protesters, and following this precedent all tickets issued under the bylaw were cancelled by the City. Now police are using the bylaw to declare protests illegal and kettle participants, while issuing tickets for other infractions such as highway safety code violations. 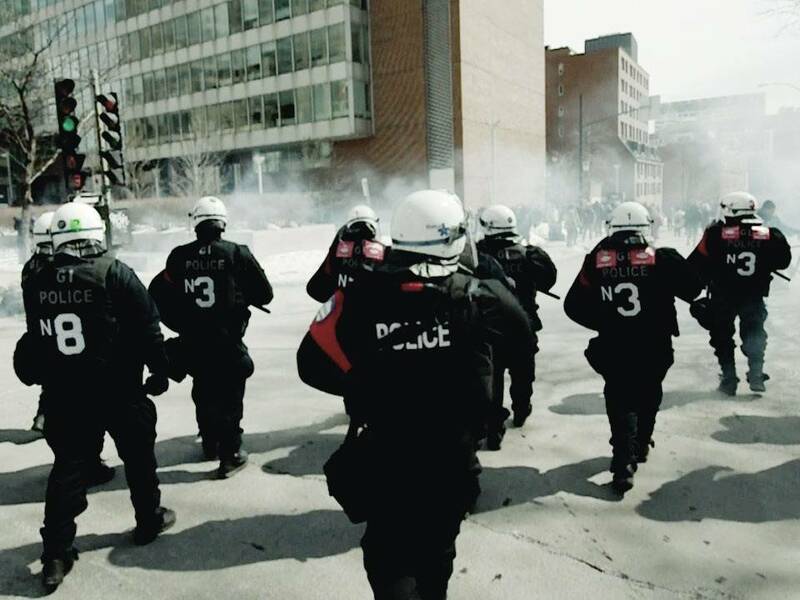 Montreal police don’t like student demonstrators, and they are making that dislike plain in the streets. There’s clear evidence of widespread police brutality, from numerous reports from mainstream journalists, to photos shared over social media of broken teeth and bloody faces due to indiscriminate baton use, to videos of cops surrounding peaceful protests and even punching a woman in the side of the head with vicious force. It gets worse from there. Ricochet published video reports on Monday’s first day of striking and Tuesday’s night demo, which both document instances of police brutality and seemingly intentional provocation. Tuesday night in Quebec City a popular activist, teacher and father of two was bitten by a police dog. The violence appears overwhelmingly one-sided. The protests have been peaceful, and aside from a few minor responses such as throwing ice back at police, there’s been no precipitating factor leading to the repression. People appear to be targeted by officers for violence and arrest because they came to a protest whose organizers failed to ask police for approval. As soon as they step off the sidewalk, they’re fair game. Police pick and choose which protests to tolerate and which to end before they begin. A mass rally in Quebec City is planned for April 11, and because its focus is climate, and it will provide a route, police will likely treat it far differently than they have the student protests. This attempt to dictate which protests are acceptable will worsen with the power to approve the route of a protest, and thus the protest itself. That’s why many Montreal groups refuse to comply with the bylaw on principle. They argue that one can’t be said to have a right to free speech if one must petition the police for permission to exercise it. Many legal observers, including the Montreal Bar, have expressed concerns that the bylaw is unconstitutional. What’s the deal with austerity? According to the Quebec government, it’s simple. We’ve been living beyond our means, and now we must tighten our belts to get our financial house in order. To hear them tell it, they’re stern but fair parents to a cranky province that needs a nap. But austerity means deep cuts to the public sector, including education, health and social services. It’s more of an ideological project than a descriptive term, and it has spread like wildfire across the globe. It relies on a fiction that compares public finances to household budgets and suggests essential services are unaffordable extravagances. To this way of thinking, protesters might as well be asking for a pony. But what’s really going on with Quebec’s money? According to think tank IRIS, between 2000 and 2008 successive Parti Québécois and Liberal governments eliminated $9.8 billion from public revenues through a series of tax cuts that disproportionately favoured the wealthy. In 2011 the government eliminated the capital gains tax on banks, one of the most profitable and least mobile types of business in the province, costing the treasury another $1.9 billion. These cuts were made, ostensibly, to stimulate the economy and make Quebec more attractive to business, but there’s little evidence that companies have done much more than pocket the money. All told it’s a hole of $12 billion in the government’s coffers. And that’s only the beginning. Writing in La Presse, economists Pierre-Antoine Harvey and Erik Bouchard-Boulianne argue that the new Quebec budget will hide a surplus of $1.6 billion in its claims of a zero deficit. Where’s that $1.6 billion going? To pay down debt, without any public debate over the drastic cuts being made to public services to do so. Harvey and Bochard-Boulianne go on to skewer the idea that these cuts are necessitated by extravagant spending on social programs such as education and daycare. They cite Statistics Canada data showing that the average cost of public services per inhabitant in Quebec is $18,381, which is actually lower than the Canadian average of $18,815. In health (~$419/person) and education (~$265/person) Quebec actually spends significantly less than the Canadian average. Whatever happens next, we’ll be there. So like Ricochet on Facebook, follow us on Twitter and we’ll keep you informed as the strike unfolds.